Negotiation is one skill everyone needs in order to get more of what they want – To sell more, to keep costs down, to manage better, to strengthen relationships – To Win! 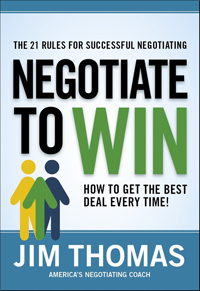 Jim Thomas shows you exactly how the best negotiators reach long-lasting positive solutions that build profits, performance, and relationships. 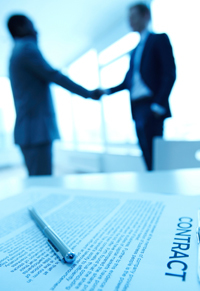 The 21 Rules of Successful Negotiating – And how to defend against them! "Quickies" – Specific tips on how to successfully negotiate with bosses, children, car dealers, contractors, auto mechanics, and many others. Why Americans are among the worst negotiators on Earth. How to overcome your natural reluctance to bargain. Why win-win negotiating is so vital. 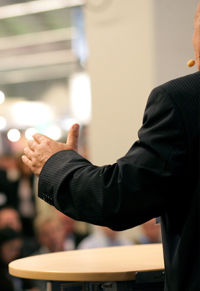 How to thoroughly prepare for your negotiations. How to deal with counterparts who intimidate or harass you. How to negotiate ethically –And deal with those who don't! How to negotiate more successfully across cultural lines. Thomas's Truisms – 50 memorable negotiating maxims. The psychology of negotiating, historical illustrations, day-to-day applications, and much, much more!